Potassium was discovered in 1807 by Sir Humphrey Davy in London. 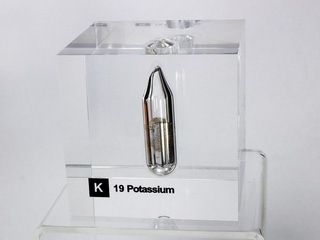 Potassium is a soft, silvery colored metal, which like other members of the alkali group of metals, is extremely reactive. 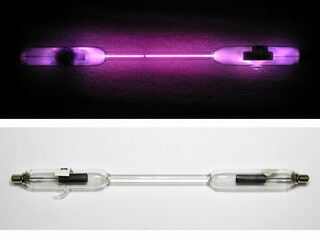 As with other members of the group, it can be prepared by electrolysis of the fused halide. It is one of the more common alkali metals, there being 26000 ppm in the earth's crust, the main source being potassium chloride. It does not occur naturally. 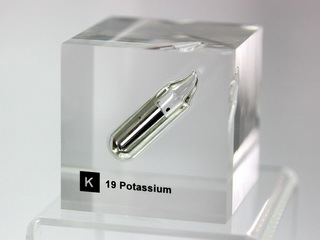 Potassium has limited use as the pure metal, although it can be used with sodium as a coolant in liquid metal reactors. It is more commonly used as a salt; for example potassium bromide, which is used in photography, and potassium carbonate which has applications in the areas of fluxes, pharmaceuticals and soaps. One of the most important uses of potassium salts is as fertilisers. Potassium is an essential element for all living beings and, on average, a human being contains approximately 140 gm, the majority of which is present in muscle tissue.